This article was originally published by My Social Good News. Click the link below to view the original article. 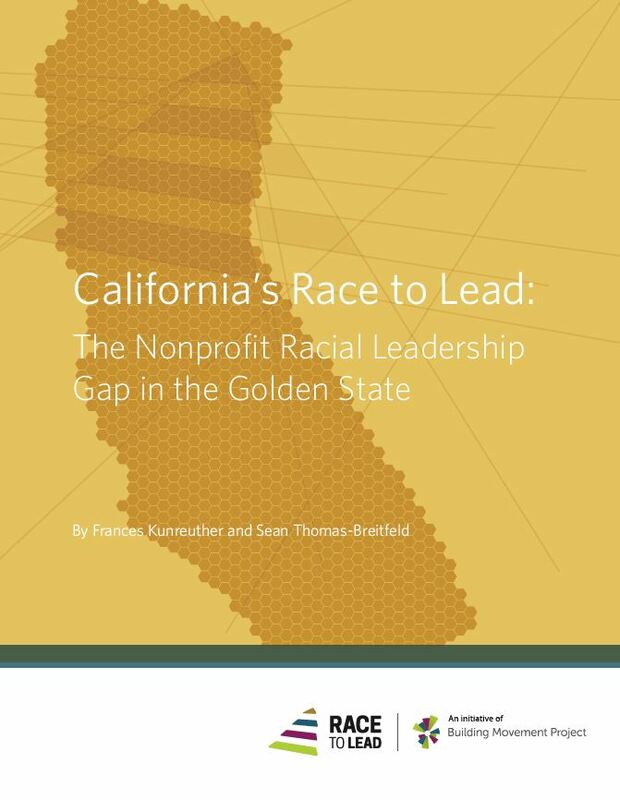 Following its groundbreaking national report on why America’s nonprofit sector has so few leaders of color, the Building Movement Project (BMP) today released CALIFORNIA’S RACE TO LEAD: THE NONPROFIT RACIAL LEADERSHIP GAP IN THE GOLDEN STATE. The report examines the diversity of nonprofit leadership in California—a state widely acknowledged as a bellwether because of its diverse population and progressive values. Given that people of color have constituted a majority of the state’s population for more than two decades, “California is particularly interesting—this data offers leaders in other states a glimpse into what the U.S. workforce will look like in another generation,” said Frances Kunreuther, Co-Director of BMP. Other reports examining the nonprofit sector in California show that the state is home to more than 250,000 nonprofits, with 25 percent led by people of color, compared to less than 20 percent nationwide. CALIFORNIA’S RACE TO LEAD compared the responses by California nonprofit staff members with more than 3,200 responses from nonprofit staff members in all other states, all of which were compiled in 2017 for BMP’s groundbreaking report entitled RACE TO LEAD: CONFRONTING THE NONPROFIT RACIAL LEADERSHIP GAP. By segmenting California respondents for the new report, BMP found that nonprofit leaders of color in the Golden State reported fewer barriers to advancement than people of color in other states and less frustration caused by the lack of role models. Further, white respondents in California were more likely than those in other states to agree that aspiring leaders of color faced structural barriers, indicating that California white respondents were more aware of obstacles than whites in other states. Indeed, on almost every indicator, people of color in the state reported less frustration and more support in their work. They also had a more positive view of how their organizations were addressing issues of diversity and race. “BMP’s closer look at the California data showed that the Golden State has made progress on increasing nonprofit leadership diversity, with findings clearly pointing to gains for people of color when compared to other states, but inequities remain,” said Sean Thomas-Breitfeld, Co-Director of BMP. “Almost 30 percent of Californians of color responding to the survey reported that their race had a negative impact on their career advancement, a disturbing finding even though it is nine percentage points less than people of color in other states,” Thomas-Breitfeld said. Additionally, white respondents reported earning higher salaries than people of color. In many ways, the findings in CALIFORNIA’S RACE TO LEAD, build on the 2006 Greenlining Institute report, which showed a lack of philanthropic dollars going to people of color communities in California. In the wake of the Greenlining report, state legislation was proposed to require foundations to share race-related information. Instead, nine large California foundations volunteered to invest more than $30 million to increase funding for people of color communities and to promote leadership diversity. The efforts have been widely praised. “But more can be done,” Kunreuther said. CALIFORNIA’S RACE TO LEAD offers specific recommendations to build on the progress made so far, including investing in leadership support for people of color-led nonprofit organizations and studying the reasons why people of color choose leadership roles. “Little is known about what groups people of color lead in California, their pathways to leadership, how long they stay and their career ladder,” the report states. “This data is invaluable to understand – and to change—barriers to POC leadership” in California and beyond. Findings from CALIFORNIA’S RACE TO LEAD will be presented in Los Angeles on February 13, 2018 and in Oakland on February 14, 2018. The events will feature panel discussions about the report’s findings and recommendations by local philanthropic and nonprofit leaders. Representatives of local philanthropic and nonprofit and organizations may attend free of charge. For information, contact Amy Watanabe at Nakatomi & Associates, amy@nakatomipr.com, (310) 914-5000. Support for CALIFORNIA’S RACE TO LEAD was provided by the David and Lucille Packard Foundation. The events in Los Angeles and Oakland are sponsored by The California Wellness Foundation, California Community Foundation and the East Bay Community Foundation.